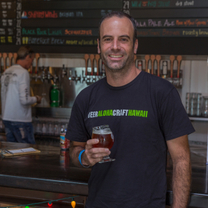 Expert Tim Golden is a certified cicerone, brewer, and owner of Village Bottle Shop & Tasting Room in Honolulu, Hawaii. Tim looks to bring a catalog of local Hawaiian brewers and it's craft beer community closer together. "Double release day at @alohabeercokakaako"
"Coming soon. Gulden Draak Imperial Stout. Just in time for the holiday season! #beerinhawaii An Imperial stout the Gulden Draak way 🐉"